This elegant hotel has been designed in particular on the cultural heritage of Yogyakarta city, and specifically to serve the guests with a new environment, relaxed, and very personal. 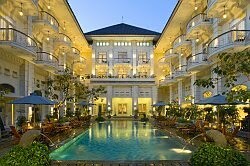 In perkembangannnya, The Phoenix Yogyakarta hotel suffered extensive renovations by combining the feel of a historic cultural heritage in the broadcast the colonial era, with atmospheric Jogja. Therefore, our guests will find hospitality ala Jogja citizens with modern hotel facilities. The hotel offers 144 elegantly appointed rooms with 10 suites and a special room for disabled people. In addition, each room have a private balcony which is equipped with modern furniture and a comfortable classic. Restaurants' Paprika; comes with an open kitchen concept and presents a special menu of Asian cuisine. There are also two bars, a 1918's Terrace Bar is open in halamannnya shows a panorama, and a special present Vino Bar at night with live performances. Was first established in 1918, this hotel was renamed in 1930 after Spledid hired by a Dutchman. In 1942 when Japan's ruling, the hotel changed its name to Hotel Yamato. After the Japanese surrender in 1945, this hotel started back in the hands of Indonesia. At the time named Hotel Merdeka in 1951, first president of Indonesia, Sukarno even had an office while at the hotel when the capital was moved to Yogyakarta, Indonesia. Merdeka Hotel name survived until 1987, and returned to the owner's grandson, named Sulaeman. After the renovation in 1993, the hotel officially changed its name to Hotel Phoenix Heritage. In 2003, Accor Group to take over the management and conduct extensive renovations at this hotel. On May 14, 2004, the name was changed to Heritage Hotel Phoenix Grand Mercure until March 29, 2009. On March 30, 2009, the hotel's name back to The Grand Mercure Phoenix Yogyakarta. Because it is situated in the central city of Yogyakarta, guests can tour the city (city tour). Use the rickshaws and carriage (transportation Jogja traditional horse-drawn) to usher in the usual routes such as the Citadel Vredeburg held, and the Taman Sari Yogyakarta Palace, Kota Gede and souvenirs to the center in the region typical Pathuk Jogja, Jogja. On average, a pedicab driver and the driver (the driver) Andong speak English at Jogja practical (simple conversations). Wow.! !I wish to visit this awesome Hotel soon,the facilities are really great and the history is indeed interesting..! !Good post and nice content.